Our hearts sank when we arrived at AirHop in Patchway, on the outskirts of Bristol, and faced hordes of excited thrill-seekers and families waiting for the 3pm session to begin. A smiley assistant informed us that up to 250 people can use the facilities each session. The thought of everyone scrambling for the trampolines in what is one of the world’s largest trampoline parks was far from inviting. However, any initial concerns were soon dispelled and we needn’t have worried. There was plenty of room for everyone because AirHop Bristol is vast with a plethora of trampolines and various zones to enjoy. 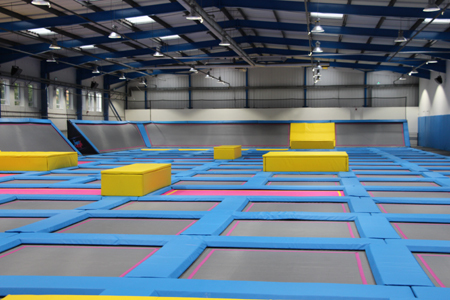 In the venue’s free area, there are over 135 interconnected trampolines covering the floor and heading up the walls. My family and I spent a fair time bouncing across this sea of trampolines. It was pleasing to know that as well as enjoying ourselves, it was very effective exercise, too. Apparently, you can burn up to 1,000 calories by bouncing up to an hour; not that we did it for that long because there were too many other things to try out. 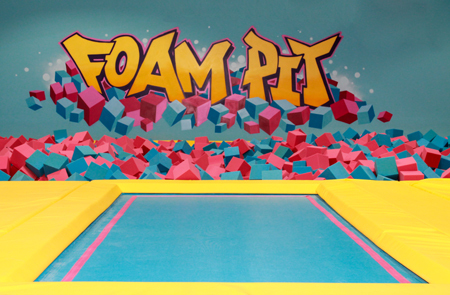 We tried our luck on the dodgeball courts before bouncing into the foam pits, competing against each other on the battle beams and trying to avoid being knocked over in the Total Wipeout zone. But that wasn’t all, we even scored a few baskets on the basketball lanes. And what pleased us is that we didn’t have to face lengthy queues, despite the session being busy. While our two children carried on, my wife and I took a breather upstairs on the mezzanine viewing level. Here, you’ll find a café selling cold drinks, slush puppies, tea and other items. As AirHop’s website states, “…it’s ideal for you to get yourself and your children off the sofa and into the air without a passport.” It’s certainly that and fun was had by all, young and old alike! 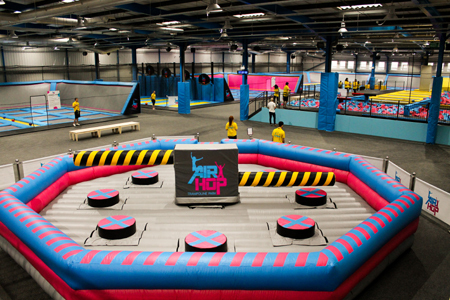 I’d certainly recommend AirHop Bristol, which is open all week; it’s a place where you can’t do anything but enjoy yourself.